Digitalcongo.net | Félix Tshisekedi in Brazzaville: the triumph! Félix Tshisekedi in Brazzaville: the triumph! In Brazzaville, the head of state Felix Tshisekedi is a regular of the presidential palace where sits Denis Sassou Nguesso, president of Congo-Brazzaville. Then president of the UDPS, Felix Tshisekedi often crossed the Congo River for consultations with President Sassou. But yesterday, it is with the cap of elected president of the DRC that Felix Tshisekedi arrived in Brazzaville. 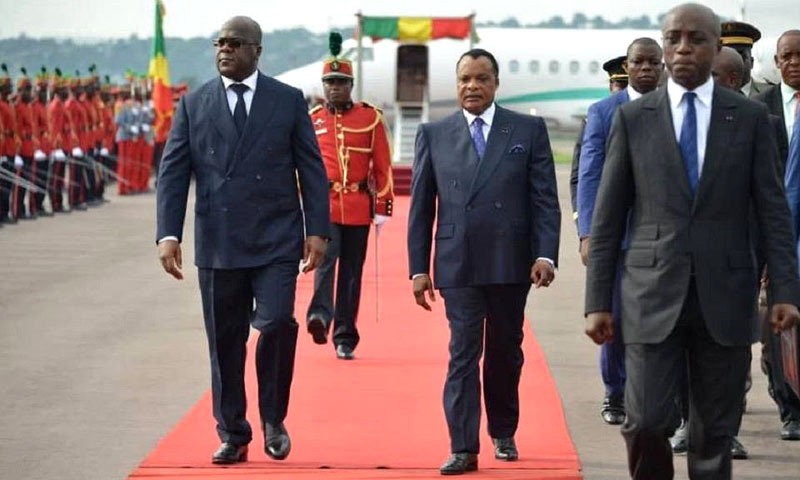 A festive atmosphere at the Maya-Maya airport-proof of the close ties that bind the two heads of state, President Sassou went to the airport to welcome his distinguished guest. Not to mention the public, especially the community of the DRC Brazzaville, came in large numbers to immortalize this moment. In Brazzaville, Felix Tshisekedi triumphed. It is by Brazzaville that the head of state, Felix Tshisekedi, has just completed his round of the sub-region as the 5th elected president of the Democratic Republic of Congo. After the stages of Luanda and Nairobi, it is yesterday Thursday around16 hours that Felix Tshisekedi landed in Brazzaville. He was greeted at the foot of the bridge by his counterpart on the right bank of the Congo River, Denis Sassou Nguesso. The two heads of state have had a long interview at the show of honor of the presidential pavilion. Nothing has filtered of this interview.